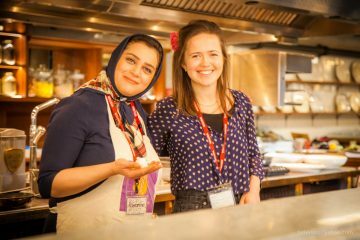 I want to live in a society where the likes of Jolanta, Claudia, Leonor, Ahmad and Noor can feel fully integrated members of our community. This is what inspired me to start the Beyond English Club which became a form of group therapy for everyone, myself included. For example, we took time defining words like home, community, equality, violence, peace, loneliness, family and integration. One session discussing romantic love, they ask me if I’m married. “No I’m single”. I share that I’m going on a tinder date that evening. “Anybody know what Tinder is?”, I get out my phone and show them the Tinder app. They think it’s hilarious. “English girls so funny” comments Piarra. Noor explains in fits of giggles “my parent chose my husband, you choose husband on phone, soo different”. Noor’s mum often comes up in conversation. Discussing “best friends”, Noor tells us that her best friend is her mother and begins to cry. That morning a Bengali speaker had translated Noor’s interview for me and seeing her cry was suddenly too much, I couldn’t hold back my own tears. I gave Noor a hug whilst all the women crowded around handing us tissues. It was a special moment. A few lessons later learning the verb “to love”, Noor said “I love my mum”, learning the verb “to hope” Noor said “I hope to see my mum one day”. I ask “What does it mean to dream?” Jolanta begins to snore, imitating sleeping. “Ok yes we dream at night. But what If I say my dream is”. “Ah yes” shouts Jolanta “My dream speak English perfectly”. Fatema says “My dream go home for brother funeral, he died yesterday, I want be with my family in Bangladesh but no money pay flight”. For our end of year Christmas party Jolanta brings a Stollen cake to share with the group. I ask “Does everybody know what Stollen cake is?”. “Who stolen cake? asks Piarra. “No stolen is the past participle of the verb to steal, this is Stollen cake”. “No understand, cake stolen?” asks Leonor. I leave it. 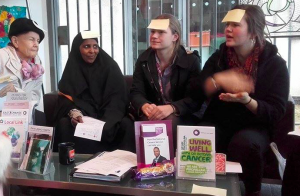 We then play the “write a celebrity on a post-it note and stick it on head” game. I write Theresa May. “Mother Theresa?” asks Noor. Nobody else has a clue who the Prime Minister is. I t hink this is brilliant. Meanwhile Noor writes the most famous actor in Bangladesh and is outraged that none of us have heard of him. I suggest that we try Disney characters: “Does everyone know Aladdin?” I ask. They look at me blankly. “You don’t know Aladdin? Come on, Jasmin’s boyfriend??”. Noor’s eyes light up “Ah yes Bin Laden! in Arabic we say Bin laden not Aladdin!” she shrieks very pleased with herself. “Hang on” I say “Is Bin Laden not a terrorist??”. In my final week I do an impact evaluation session. 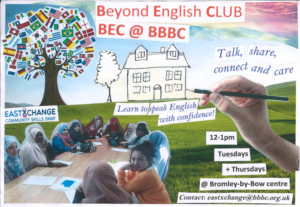 Everyone reports feeling more confident speaking English, more emotionally supported, more positive about their future and more connected to their community since coming to the Beyond English Club. This is wonderful news. These individuals are some of the strongest, most inspiring humans I will ever meet. 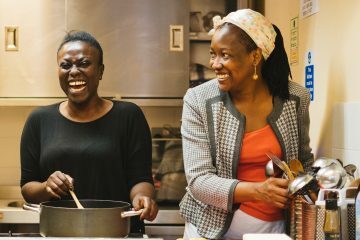 They have been pushed from their homes under very difficult circumstances, and I believe we should do everything we can to help them feel at home in the UK. For those that share this view it is sad to know that many in our country as shown by the Brexit vote, have expressed a lack of compassion for the migrant cause. 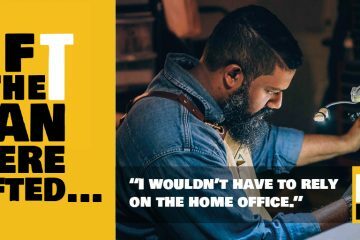 This is a time when the government are pulling away their support to help the integration of migrant communities, creating a divided society and releasing the very forces of racism and prejudice that we should be working to eliminate. Starting this group has shown me that there is always something we can do on a grassroots level to build stronger communities in the face of government cuts.